Happy Halloween! If, like me, you're planning on having a spooky evening in, curled up on the sofa with treats, then this post is for you. Whilst the majority of Halloween fans might be heading to parties or out on the town in costume, when it comes to Halloween my favourite thing to do is carve my pumpkin, and snuggle down with either a spooky film or something equally as scary to read. Paul Morris, the lead protagonist in this story, is a bit of a compulsive liar and within the first few pages I'd already taken a total disliking to him. It tells the story of how he lies his way into his new girlfriend Alice's life, and goes away with her and her friends to a villa on a Greek island. Alice is seemingly obsessed with the disappearance of Jasmine, a teenager who vanished from the island a year previously, which is the main focus of the novel and when things start to get really interesting. I really enjoyed this book and it definitely had me guessing, but I would say it's a bit of a slow-burner and not quite as gripping as the other books included in this round-up. It's definitely still worth a read though! Okay, so this is quite possibly the best thriller I've ever read. I picked it up on a whim when I was in the supermarket, and boy am I glad I did. Throughout the book we see things from Louise and Adele's points of view. Adele is beautiful, charming and elegant - although seemingly slightly unhinged, as she befriends Louise once she finds out she is sleeping with her husband, David. The two bond over their shared experiences with night terrors, and as we learn of Adele's past in a mental institution, things start to take a sinister turn. This book will have you gripped the whole way through and is full to the brim with twists and turns, constantly leaving you guessing. It's unsettling, full of suspense and honestly the ending is like nothing I've ever read. You NEED to read this book. Annie's mother is a serial killer. After years of experiencing her abuse and witnessing countless murders of innocent children, Annie hands her into the police. Given a new name and a whole new life, Annie becomes Milly, and moves in with a foster family in London. But, as the trial of her mother looms, will her ties to her ever really be severed? 'Good Me Bad Me' is unnerving, suspenseful and brilliant. I couldn't put it down and never expected the ending. Another must-read for thriller fans. I'd seen loads of bloggers raving about this book on social media so couldn't resist joining in the fun! The book begins as Anne and her husband Marco are enjoying a dinner party at their neighbours' house, which happens to be next door to theirs. Their host, Cynthia, had insisted that no children were allowed at the party, and so Anne and Marco had left their baby daughter at home, checking on her intermittently throughout the night. When they go home and find her missing, however, their world begins to fall apart. But who could have taken her? This was another total page-turner and one that had just enough twists and turns. Whilst I did somewhat guess the ending, it still kept me entertained and is perhaps the most 'real' of all the other books I've mentioned. Have you read any of these? 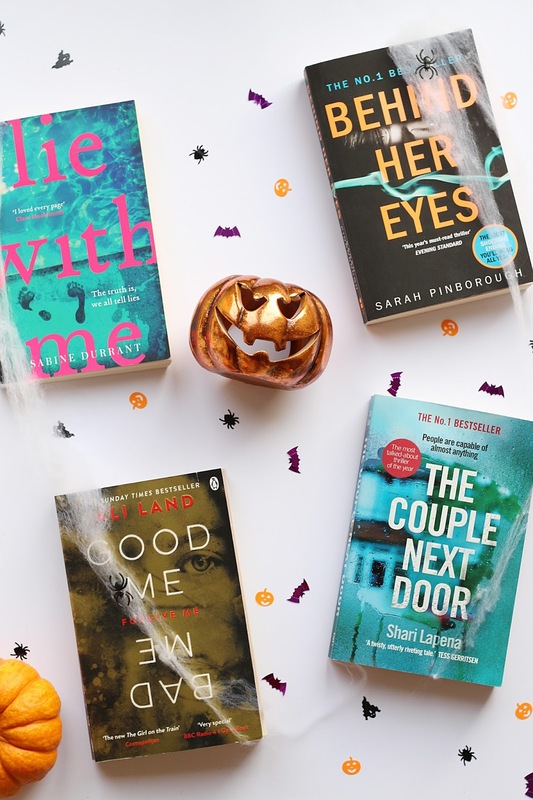 Let me know your favourite thrillers in the comments, and also what you'll be getting up to this Halloween!